A group of Union soldiers break camp as morning dawns. It’s not nice to blow your bugle directly into someone else ear! Ouch! Reinforcements file down an old dirt lane to join the growing fray near Gettysburg. A full third of all the men who fought at Gettysburg would become casualties. Time to pour another round at the distant Rebels! Fancy duds! This zouave prepares for action. The Dobbin House museum, gift shop, and diorama closed for good in 1975. Gettysburg resident and wargaming building retailer John Mayer of Round Top Miniatures believes it was moved to another building for storage, but the roof collapsed on it. He is unsure of the whereabouts of these figures today, if they even still exist. I vaguely recall a small, thin picture book (Golden Book style) with photos of the diorama that my Mom allowed me to pick out and buy to take back to my best friend Mike as a souvenir. I have never seen a copy of that book for sale on eBay or elsewhere. Anyone else have any photos of this old diorama to share? Scott, I may have that book that you’re describing at the end of your post above, but I’ll have to hunt for it. My grandparents bought it for me when I was in grade school back in the mid-60s. As far as I know, there were three books. Besides the one on Gettysburg, the other two were on the battles of Trenton and the Bulge respectively. I don’t have the the Bulge book anymore, and I may not have the one on Trenton anymore either. They were influential in my start into gaming with Britains and Airfix figurines. Oh, I think that the photos were taken by Philip O. Stearns. The books you are referring to are called “GREAT BATTLES OF HISTORY.” The Gettysburg book was written by William O. West. Photos by Albert Squillace. The book was published by WORLD PUBLISHERS in 1966 Library of Congress Catalog # is 66-15989. I am looking at it right now. I also have the Trenton book. Most of the figures in the first photo are Busslers. The Cavalry are Hellinic (now Imrie/Risley). The marching men are also Busslers. The Bucktail figure is a Cavalier or Tradition. The Zouave is also a Tradition, I think. In the intro to the book, the Dobbin House Diorama is credited to Mr. and Mrs. Curvin Heiss and their son Corky. Lt. Col. Vorin E. Whan is also credited as military consultant. Thanks for taking the time to add your comments! 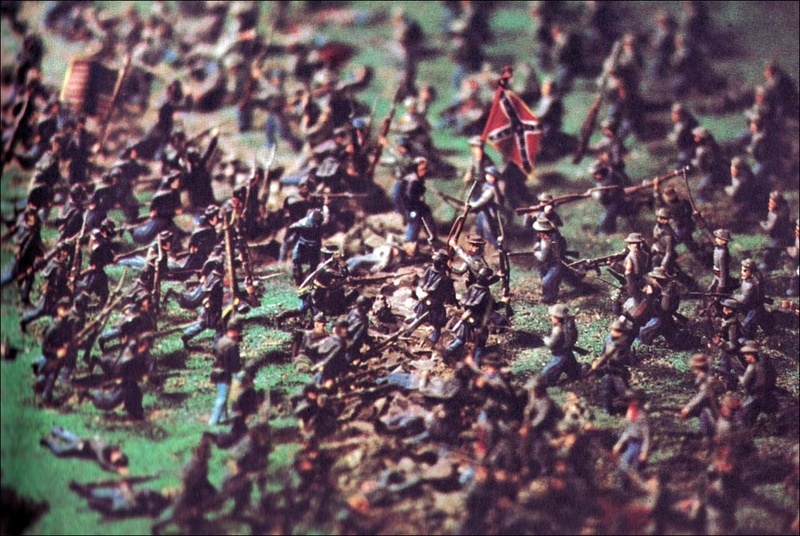 My friend loved the book that we brought him, and he and I spent hours setting up my 54mm toy soldier collection and refighting the Battle of Gettysburg. It was the early impetus that later led to my wargaming hobby activities and my passion for creating the Gettysburg gaming scenarios that Ivor later published as Enduring Valor: Gettysburg in Miniature. You just solved a mystery for me. In 1963 I, as a ten year old, received a gift from Bruce Catton in response to my fan mail to him: a copy of his 1962 juvenile edition of “This Hallowed Ground” lavishly illustrated. Three of the images in your post are used as illustrations in the book plus the double spread front and end papers are of larger portions of the diorama. 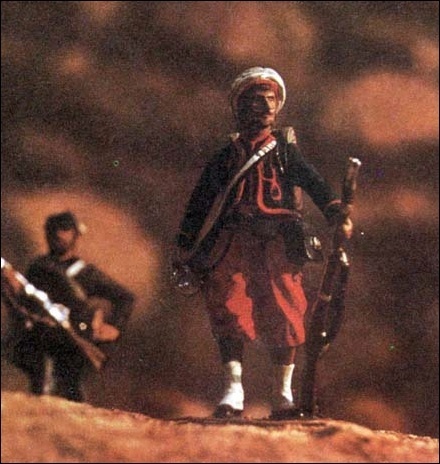 As a kid the images of toy soldiers in an actual BOOK mesmerized me! This will be grist for a future post on my blog. Very fine. I wish there was more. I’d drink it up. I first saw this magnificant diorama in July of 1963, at the 100th Year Anniversay of the Battle of Gettysburg. I had just started building ACW Bussler Miniatures months befoe and thought I was in heaven at 14 yrs of age. I was devastated years later when I returned and it was gone. What a shame that this reflection of history could not be made available to the public somewhere else. I believe I still have my own photos of this diorama packed away somewhere. I will see if I can get at them to download. Thank you for bringing back the exciting memories I had as a child. I just found a copy of that book ‘Great Battles of History Gettysburg’ and am about to list it on Ebay. It is WONDERFUL…I had no idea that the toy soldiers had been in the Diorama! Just wanted you to know that it should be up with a week or so in my Ebay store: Capital Beltway Bargains’. Wow! I HAD the Gettysburg book and the Bulge book. I never saw the Trenton book,but would LOVE to find all of these books again someday. I was first in the Dobbin house when I was 7, in 1973. I don’t actually recall the diorama,but I probably saw it. Relating to the above, I have the Golden Book in mint condition and I even have the little Dobbins House red and blue flier above. In addition, I have “This Hallowd Ground” with the many diorama shots. All these are in boxes packed away for decades; perhaps it is time to get them out and ebay them for the younger generation so see what we really called fun. Does anyone remember Military Art Galleries out of California in the 60s? I have a catalog of a host of 54mm ACW miniatures from them. I tried to order from them around 1963; however, they sent a simple post card stating “PLEASE DON’T WRITE US”, so I don’t know what happened to them; maybe litigation? Anyway, most of the soldiers illustrated have realistic positions and postures that I have never seen duplicated to this date. I am not sure but I think Michigan Toy Soldiers how have the rights to the old Bussler miniatures that I coveted so much in my early days. Glad to see this site is still up and running. 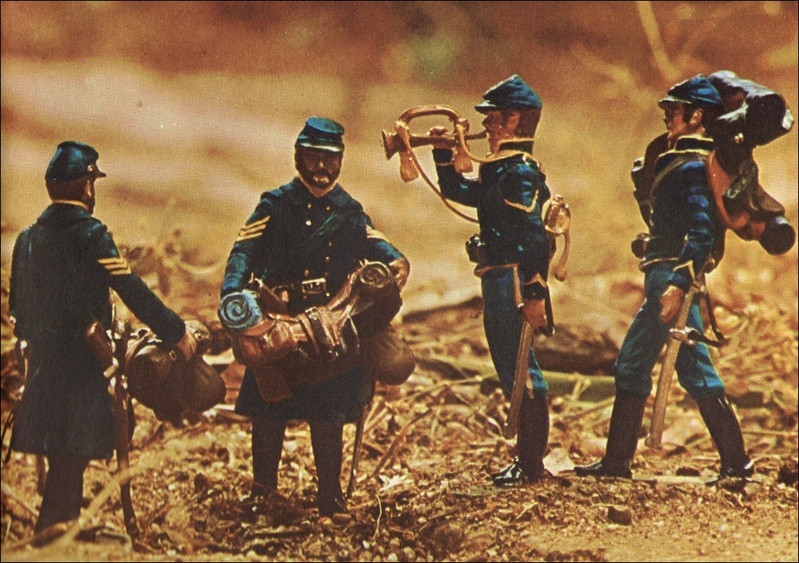 I fondly remember this diorama from my first (of many) trips to Gettysburg circa 1970. 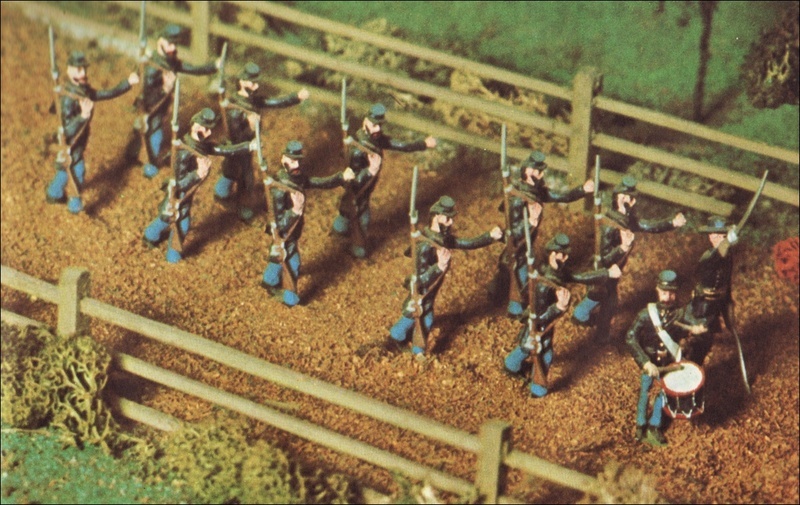 As a young budding history buff and toy soldier fan I remember being mesmerized by this diorama. I was fascinated by the detail and especially recall a dog sitting faithfully at his master’s gravesite. for your interest in the Dobbin House. Hi, I am Donna Bussler. My dad was the famous Bussler Miniatures! I was interested in your site. Just saw it. I have a beginning of an idea. The beginning where all possibly great ideas come from. If u want to converse, please feel free. I think that anyone who values history might want to explore the past. I hope you realize that your Dad affected many lives in a most positive way that followed them even into their 60’s (like me). May healways be blessed for his contribution to History. It is a shame that this icon of Gettysburg is no longer. This is a great article! I went to Gettysburg ever year from 1969 through 1973 with my dad, I could never get enough. One year while looking at the diorama for what must have seemed like hours to my dad the older gentleman who worked there asked if I would like a few of the figures. I still have them to this day, they were painted Airfix type, not the Bussler Minatures, but still even today cherished by an old man. I went to the Dobbin House museum and diorama back around 1959 with my parents. This was one of the highlights of my youth. It led me into Bussler Miniatures and model soldiers for many years after. I often wondered what ever happened to the diorama and now it’s sad to know that it no longer exist. I would love to see it just once more. I am an older man now at 61 and must admit that the Dobbin House helped play a significate role in my life. I’ve just completed 36+ years as a history teacher …. Now you understand. Thank you to the Heiss family and to Mr. Bussler. This looks like an amazing diorama. You are saying that it doesnt exist anymore? oh man! I would have loved to have seen it and look at all of the time and effort was put into it. That is really disappointing. Final comment – the Time article stated that at Gettsburg the loss of lives in three days equaled six weeks of casualties on Iwo Jima. As to the GREAT BATTLES Of HISTORY “GETTYSBURG” book by WEST—-PAGES 34 & 35 depicts BUSSLER figures that were part of the GEORGE BERARDI ‘s PICKETT’s CHARGE diorama———– As to THIS HALLOWED GROUND (for young readers) book by CATTON—-PAGE 159 and INSIDE FRONT BOOK COVERS depicts BUSSLER figures that were part of the GEORGE BERARDI’s PICKETT’s CHARGE diorama——–Please contact MRBUSSLER@AOL.COM for additional data on DOBBIN HOUSE GETTYSBURG BATTLE diorama . Anyone else I am trying to find the value of the Bussler Charging Caisson/lumbar and gun set Painted by Leo Meyer and maybe Dr Bussler or his painters. I don’t usually browse here so email is the best chance to contact me. if any of you are looking for a copy of the book I recently posted one on ebay. Ben, Do you know how I can sell my bussler figures? I am not into ebay. I would love to have them! I will send you an e-mail. This comment may or may not be seen as this is a very old post- but I am looking for a copy of the “Great Battles in History” book on Gettysburg. My husband remembers this book fondly from his childhood visiting his grandparents (who are now gone) and would love to give him one as a present! Wow! So many memories! My first exposure to the Dobbin House Diorama and Bussler figures was through my grandmother, who visited the place with my aunt and uncle in 1960. She asked the owner if she could purchase some of the figures (for me!) and he told her he would not sell them, but gave her the address of Bussler Miniatures. She obtained a catalog, which I still have, and ordered the set of two litter bearers with amputated leg patient. From then on, all my lawn mowing money went for unpainted Bussler figures from the Civil War catalog and others that Bussler produced. Like others, I was heartbroken when I returned to Gettysburg after the diorama was moved out, and now feel even more badly to learn of the destruction and apparent loss of all those figures. I am, however, grateful that I have my own Busslers that I collected through the years. They’re priceless to me. 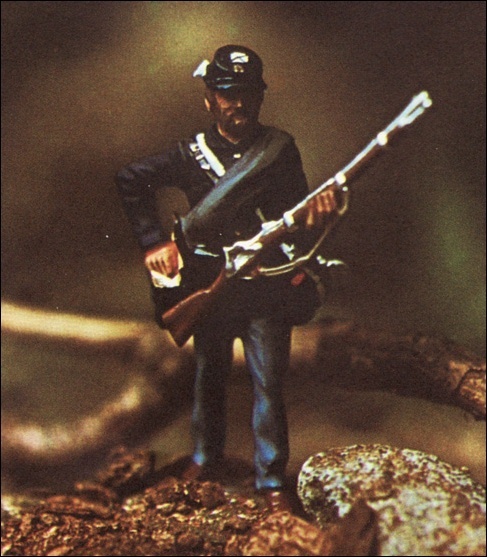 Hello, just wondering if anyone knows who did the figurines that wherein the dioramas at the gettysburg cyclorama? My understanding is they were Bussler figures from Bussler Miniatures in Wollaston, MA. I enjoyed reading your comments regarding the Dobbins House diorama. My exposure to it was in the seventies in the form of photographed illustrations in The Youth Edition of Bruce Catton’s “This Hallowed Ground”. I just recently bought a copy I found online. Now I’m enjoying the book all over again. I still have my original collection of Bussler & Imrie-Risley ACW miniatures and almost another 1000 54mm ACW figures that, unfortunately, I can no longer assemble, paint and display due to my failing eyesight. I also have a small library of miniature books and magazines. The more recent figures were purchased over the past 15 years and include almost every miniature company available at that time, some still existing and many others that either have gone out of business or their miniatures have been discontinued. The vast majority of them are not assembled or painted and the painted ones from Conte, King & Country, Britain and others are in excellent condition but their original boxes are long gone. I am considering putting them up on Ebay in 2019, although, I wonder if today’s youth even have any interest in our history. It all started here at the Dobbins House in 1963. It was a great ride!